Now here is a story with a twist. When faced with false accusations and public humiliation, our hero shows us how to do what's right, even when taking the easy way out could have cleared his name. 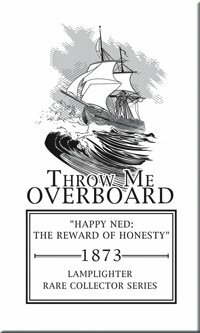 As he travels the tempestuous seas of dishonesty, greed, and distrust, you will find yourself so engaged with the story that you will literally want to deliver this lad from his distressing quandary. And if this isn't enough to capture your attention, you will meet our heroine Florinda, who is faced with a most difficult decision as she deals with pride, vanity and peer pressure. Wonderful Book For All Ages! From Olivia of Louisville, Kentucky on 1/27/2017 . I read this book in one sitting. For such a thin read, this book packs a punch, even though I am seventeen years old and way past the suggested reading age. Though the hero takes honesty almost to a fault, his dedication to truth is inspiring and convicting. Read this book; it will challenge you to strive for truth in your own life, even if it means going overboard.